Cambridgeshire is not a county readily associated with holy wells, however my research for volume VIII in my series suggests that there are a number of little known sites. 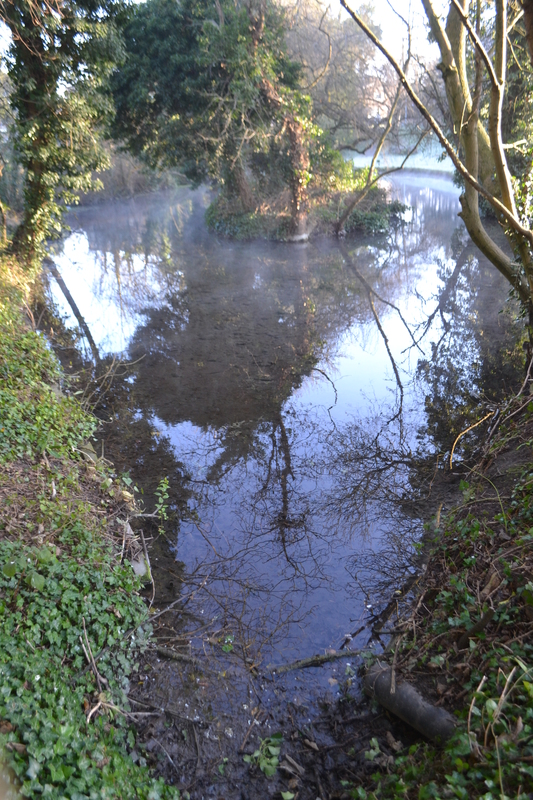 Frustratingly, there a number of attractive and curious streams in the county, especially in the chalk regions, but their names tell nothing – often being called simply – the spring head or numerically named such as Nine springs. One such Springhead has given us a bit more to go on, its alternative names – Robin Hood Dip or bizarrely Giant’s Grave are far more tantalising. A peacefully evocative site sandwiched between two rather busy roads. A delightful place in spring when its surrounding cherry trees are rich in blossom. Very little is written down about the spring head except that in modern terms it was used as a water source for the village and as a laundry! However it is surrounding landscape and legends which perhaps provide a clue. All that is known is that the giant was buried at the site and that he is thought to be Gogmagog, the name also applied to nearby hills. One of these hills, Wandlebury, is a hill fort to which a considerable amount of confused history, mystery and legend has been attached. What is interesting is that when folklorists collected stories of the giant (or giants as it really is Gog and Magog traditionally) it was noted that they were buried nearby but not where. This is along with a golden chariot at Fleam Dyke. Lethbridge using rather unusual archaeological methods apparently revealed this figure, or as it turned out figures and although his work was criticised, traces of his giants remain and his theories have relevance to Cherry Hinton’s spring head. Does the name of the camp remember Wandle, an ancient God or Woden, a deity often associated with water? Or does as the Cherry Hinton Chronicle of 1854 records in 1854 the discovery of Iron Age burials unearthed locally on Lime Kiln Hill whose the skeletons were unusually tall gave rise to the legend!? Across the road from the spring head at the Robin Hood and Little John Inn is a curious stone. Rather unceremoniously placed by the car park the large round stone looks like a glacial erratic and clearly left there or placed there at some time. But why? A closer inspection reveals it to be hollowed out and the hollow is like a footprint or more like a shoe, around a size 11 as it fits my shoe well! Carved foot print stones are widespread, often associated with prehistoric burial chambers as far afield as the Calderstone at Liverpool to a burial chamber Petit-Mont Arzon in Brittany, France. The Romans too carved such footprint stones inscribing them with pro itu et reditu, translating as‘for the journey and return’, the tradition would be to place one’s feet before and then after the journey as a good luck. Footprint stone and wells are not infrequently met. There are two in Kent for example, St Mildred’s or St. Augustine’s stone near Sandwich (now lost) and the Devil’s footprint at Newington once associated with a barrow (now lost). So there might be some precedence? Of course the hollow could have a much simpler explanation. It could have been made as a socket for a cross. However, here we have another interesting possibility, such holed stones called bulluans are associated with holy wells, and although none exist in Cambridgeshire it is tantalising that this could have been one. The alternative name, Robin Hood Dip is one which creates the most curiosity. There is no record of the folk hero in Cambridge, as far as I am aware, and this is well beyond Sherwood Forest! Taking to one side the possibility that it’s a site which achieves its name from story-telling about the folk hero’s exploits, explaining its name appears at first difficult. However, folklorists will have another explanation. Robin Hood is a commonly met name for an elemental, a fairy folk or spirit and what is more interesting he is often associated with springs and water places. See this article for more of an overview. Why is this name associated with springs? I have made various suggestions. Firstly, the associated with a sprite may discourage use – i.e a warning off children and secondly it may record an earlier cult presence. Perhaps the Giant and Robin Hood are the same folk memory of a deity which was celebrated at this spring. The name Thirs interesting is also associated with springs and water holes and this is Saxon word meaning possibly ‘giant’! The Roman connection may also give support to this idea. 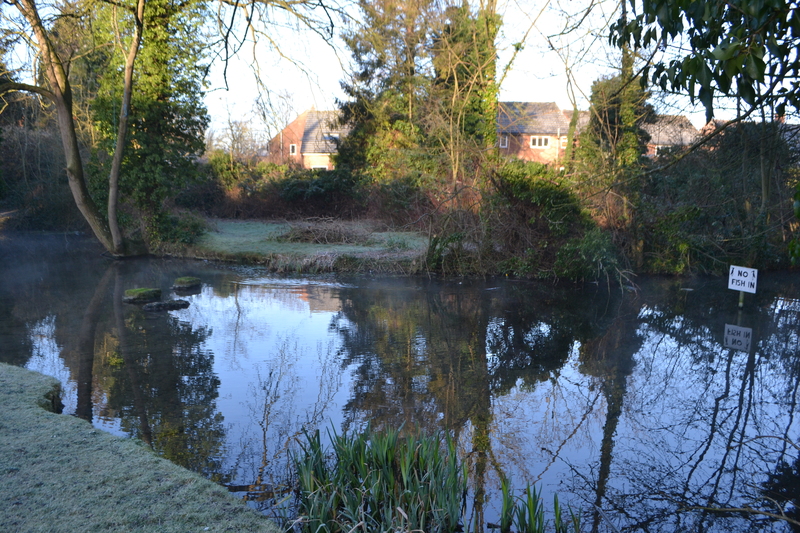 It is known that the river Rhee, arising at Ashwell was associated with Roman shrines and a deity called Seunna. Was Granta a Roman deity? Is there an unwritten story which connects Granta and Woden which would explain the grave? So what do all these different facets bring to the site at Cherry Hinton? The legend of Wandlebury is rather lacking of any location for a grave and its fairly obvious perhaps that the name is derived from the large grave shape size of the springhead. But does this remember a folk memory of it being dug? Or does it remember the presence of large bodies in prehistoric graves? The interesting point is that the island is called the grave according to local tradition. Did this mark a barrow? Nearby on the Fulbourne Road were found three Bronze Age ring-ditches and Neolithic flint artefacts and Early Bronze Age pottery were found in the locality suggesting a long period of history. As well the Iron Age material earlier. It is very likely they settled here for the water supply and it is very likely it was culted. What of the stone? Is it coincidentally located near the springhead or does it remember practices at the well? 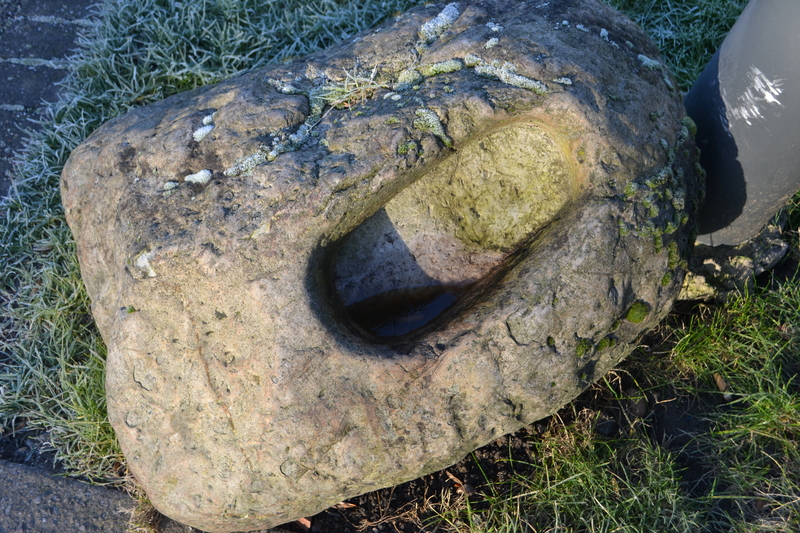 Is it a Kingship stone, a receptacle for healing water or a simple cross base? There appears to be a considerable amount of unknown history to this simple, but picturesque, spring head and whilst we must always be wary of neo-pagan exaggerations, it does seem plausible that this is a long lost sacred spring. Sacred to the Saxons, Sacred to the Romans and perhaps long before this! Holy Wells and Healing Springs of Cambridgeshire.